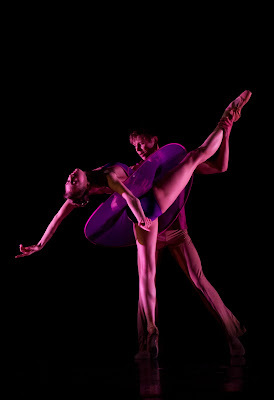 Company C Contemporary Ballet's 2011 Spring Program was my second encounter with this dynamic group of artists. With two world premieres (Charles Anderson's "Ballet Noir" & Jodie Gates' "Slip-Ring"), Patrick Corbin's "Psychedelic Six-Pack" and Twyla Tharp's "Surfer at the River Styx", Company C has proven yet again that they are a leading contributor to the genre of contemporary ballet. "Ballet Noir" took us inside the subconscious of a genius. As Robert Dekkers (who played the role of the choreographer) sat attached to a chair, his creation and imagination spun around him. A bizarre, and somewhat unrelated cast of characters filled the stage including three muses - similar to Balanchine's "Apollo", though a much sexier interpretation. "Ballet Noir's" scene was his [Dekkers', as the choreographer] vision, his orchestration, yet he was limited to watching it unfold. His main participation occurred in the very last moment of the piece, when he stood up and was kissed on the cheek by one of the dancers. It was almost a goodbye; as if his mobility caused the dream to disappear. Charles Anderson's new work definitely drew the audience in, though the subtext would benefit from the dance being slightly longer. Jodie Gates' "Slip-Ring" was a non-narrative juxtaposition of angular and circular sequences. The piece was filled with straight, sharp, staccato choreography, but in order to fulfill those movements, the body had to travel on and in circular pathways. Gates was very successful in illustrating that the pursuit of one course may require you to journey in the completely opposite direction. The excerpts from Patrick Corbin's "Psychedelic Six-Pack" brought together the tribal, social, spiritual and sacrificial aspects of society while exploring the combination of ballet and modern dance. In the midst of much stage activity, some individual moments particularly stood out. A recurring pose where the dancers stood in parallel fourth position as their palm reached up to the heavens provided simplicity, stillness, groundedness and hope. And, Chantelle Pianetta's combination of jazz inspired lay-outs followed by crisp glissades in fifth position was a beautiful commentary - the traditional meeting the contemporary. "Surfer at the River Styx" was not a typical Twyla Tharp composition - much darker and emotive than her earlier work, its choreography was clearly a departure. "Surfer at the River Styx" wasn't my favorite (the dance is far too long), though I must admit that the content was much clearer than I have come to expect from her work. For me, her dances feel frenetic, manic and sometimes hard to follow due to the dense physical material that she opts to include in one piece. With so much going on at once, her choreographic brilliance gets lost in the commotion. Here, the action was much more focused and her treatment of modern technique even seemed to have a little Cunningham flavor.